I had heard of “Ready Player One” from other bloggers. I thought of the premise to be interesting, actually very interesting, and when I received the book, I could not stop reading it. More so, I finished reading the book twice in a span of six days and loved it more so the second time round. Now let me tell you something about the book: The book is set in 2044 and the future is not very bright. It is everything but happy and cheerful. Everyone wants to escape reality and people choose to enter the world of OASIS instead, which is an artificially created simulated world. The simulated world is created by a man named James Halliday, a geek – the ultimate lonely human being, who was obsessed with the 1980’s. Halliday dies at the beginning of the book, a billionaire with no heirs to his property and wealth. However, before dying he created a game within OASIS. The winner of the game would have to find three keys, leading to the ultimate find – the Egg. The winner would win billions of dollars. Everyone is in the rush to find the egg and win the prize. The protagonist of the story is an eighteen-year old boy, Wade Watts, with almost an in-built obsession to do anything with Halliday or the 80’s. He lives in poverty with his cruel aunt (the regular orphan theme) in a trailer – which is quite surprising because in this world, the trailers are laid on top of each other, connected by a platform of sorts. He wants to get out of this misery and for him the only respite is living in OASIS. In this world, he meets his virtual friends – Aech and Art3mis. His own virtual world name is Parzival. The three of them head out to find the keys (separately or together is something that you have to find out). The story becomes only more interesting with more Gunters (the ones who are in the game) in the running for the Egg and another group called the Sixers, who work for a villainous corporation called the IOI who want to take over OASIS. Wade has a lot of challenges set in his path before he can win the contest, however does he win or not, is the main question, for which you have to read the book. The book is fast-paced (but obviously) and very intelligently written. I loved the random 80’s clues placed all over the book. From book references to movies to music to video games to the kind of computers made back then, it is all there – almost like reliving/living the 80’s. There is so much at the same time that I can go on about OASIS as a virtual world; however you need to read it to experience what I did. The writing is crisp in most places and there is a lot of ground that Cline has covered (which is quite evident) in shaping this book. I was tempted to draw parallels to The Hunger Games Trilogy, however that was just initially. Both the books are very different and hopefully intended for different audiences. “Ready Player One” has it all – the ethical dilemmas, the love story, the virtual fantasy element and what it takes to be human in these such as these. It is definitely a page-turner and I am glad that there would be no sequel because the book is complete. The reader will go back and forth to mark the 80’s references and go back to them, at least I will. I absolutely loved “Ready Player One” and would recommend it to one and all. 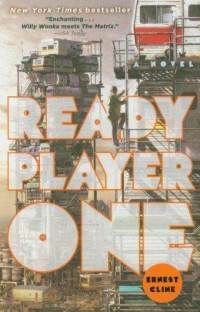 This entry was posted in Books, Broadway Books, Crown Books, fantasy, random house, Review, Science Fiction and tagged Broadway Books, Crown Books, Ernest Cline, Fantasy, random house, Ready Player One, science fiction on November 12, 2012 by thehungryreader.